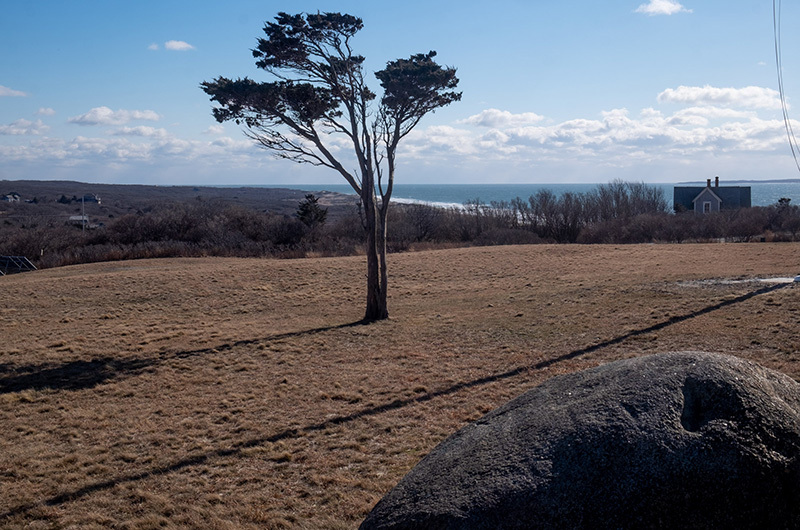 Remote Aquinnah on a winter day. Citing concerns about plans by the Wampanoag tribe to build a class two gambling facility in Aquinnah with no oversight, the town selectmen have turned to the Martha’s Vineyard Commission. In a letter to the commission last month the selectmen asked the commission to exercise its authority under its enabling act and review the proposed bingo hall as a development of regional impact (DRI). The Jan. 16 letter to the MVC is the latest volley from the town in a recent exchange of written correspondence with the tribe over casino plans. The tribe was cleared to build a bingo hall on tribal lands in Aquinnah a little more than a year ago when the U.S. Supreme Court declined to hear further appeal in a federal case that upheld the tribe’s sovereign rights to build the facility. Since then only scant details have emerged about the plans. Late last summer tribal leaders announced a partnership with the Chickasaw Nation Gaming Corporation of Oklahoma to build the gambling facility. • That the new facility is being planned for the former Weiner property off Black Brook Road now owned by the tribe and taken into federal trust. • That the 10,000-square-foot facility will be made from so-called Sprung construction, a trademarked fabric-covered structure. • That the facility will include no restaurant but be serviced by food trucks. • That the tribe intends to apply for no permits except a beer and wine license from the town. The letter asked for a response by Jan. 15. On Jan. 16 the selectmen sent the letter to the commission seeking a DRI review. On Jan. 18, Ms. Maltais sent a letter of reply to the Jan. 8 letter, requesting another meeting between selectman Jim Newman and/or Gary Haley and town counsel Ron Rappaport. “We are still in the planning stages but appreciate the open dialogue we had with Jim Newman and Ron Rappaport, and we look forward to continuing the conversation,” she wrote. The letter also suggests that the third selectman Juli Vanderhoop recuse herself from the discussions between the town and the tribe over the casino, citing a reported legal dispute between Ms. Vanderhoop and the tribe over a commercial lease at the Cliffs. “Given her conflicting interests, the tribe does not believe it is appropriate to discuss this or any other tribal matter with [Ms. Vanderhoop],” Ms. Andrews-Maltais wrote in part. Ms. Vanderhoop, who owns the Orange Peel Bakery in Aquinnah, is the only selectman who is a member of the tribe. She has been openly critical of the tribe’s closed-door process surrounding the bingo hall plans. Contacted last week for comment about the town’s letter to the commission seeking a DRI review, Ms. Andrews-Maltais said she had not seen it. Commission executive director Adam Turner said the letter had been received but not yet discussed by the commission. Created by an act of the state legislature in 1974, the commission has unique powers to review and regulate developments. MVC chairman Doug Sederholm said if the commission does decide to review the casino plans, it likely will be through the commission’s two-step concurrence process, where the full commission first takes a formal vote on whether a project meets the criteria to be reviewed as a DRI. If the commission does vote to review the project, the process would be carried out like other regional development reviews, he said, with a full public hearing, testimony, deliberations and eventually a vote. Mr. Turner concurred on the process. “Over the years, a lot of big projects have come through our doors, and this would just be another one,” he said. Can a lawyer weigh in here on these developments? What happens if the tribe goes ahead and builds without building permits? The whole island is buzzing with excitement about bingo. Driving up island in the dead of winter to drink and lose money at bingo. Food? Nah, but hey, maybe there'll be a food truck somewhere nearby. Pollution and Gambling Casino and jets....what an impressive place to want to visit. What is the name of this island? Certainly NOT Martha's Vineyard . That island left long ago! Vanderhoop should stay. She’s an important voice. Her stuff concerning her Orange Peel Bakery has no bearing whatsoever on this matter.. This attempt to eliminate the only tribal member is fully transparent. Of course the proponents of this stupid gaming hall idea (which everyone wiho loves this place knows is a very bad idea both for Aquinnah and the island) would see her voice as a potential threat and would look for a reason to exclude her. Here’s to The Martha’s Vineyard Commission. Do the right thing and let this gaming hall idea be squelched once and for all by common sense and a regard for the greater good of this precious isle. They tried to stop them and lost at the Supreme Court. Now let’s see if the MVC can regulate a sovereign group. More legal fees on the way.